There is a tradition that the Loe Pool claims a victim every seven years. It is a morbid assumption but one that appears to be accompanied with a certain amount of truth. 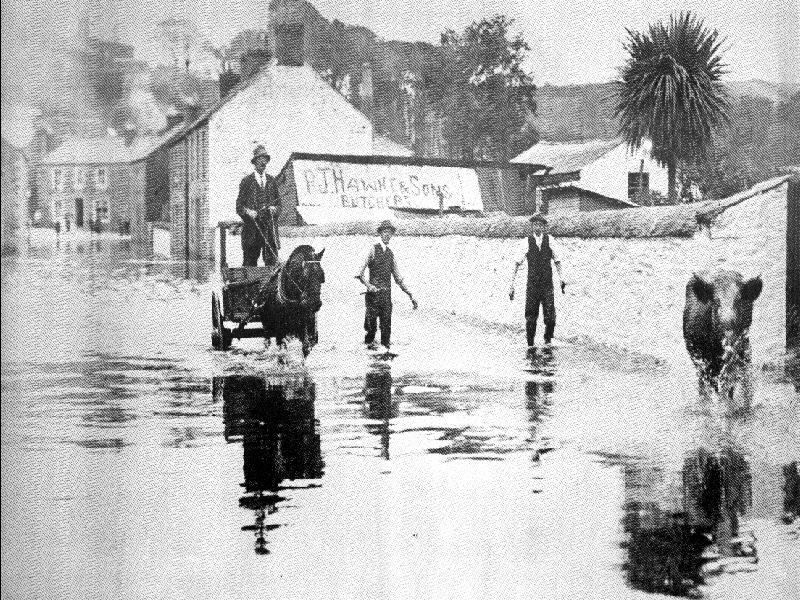 The trouble and discomfort that storms could cause when the turbulent action of the seas caused many thousand tons of sand and shingle to block the outlet of the Pool and torrents of rain which often accompanied these storms soon became apparent to residents of the lower part of the town, particularly in the St. John’s Road, or Lower Road section. The rising waters of the River Cober in the mid 1920`s bear witness to this only too frequent occurance. The axle deep cart, driven by Mr. EDWIN ROWE, requires no comment about its dis-comfort, and perhaps the animal being rescued by brothers LESLIE & HARRY HAWKE, might not have been so complacent if it could read the sign on the galvanized shed behind it! The sluggish river gave place to a torrent which overflowed its banks, forced back by the rising water from the Loe which could not escape, forcing an increase in height of ten, twelve or more feet. It was then that hasty barriers were erected against doorways, boards fitted, sandbags piled in an endeavour to stem the flow, often without avail as the water emerged from the sewers and drains which under ordinary circumstances fulfilled their appointed tasks satisfactorily. Carpets, mats, furniture would be hastily removed upstairs while the rising mess, for it brought its filth with it, would be anxiously watched as the first step of a stairway would be immersed, next day the second would receive similar treatment. On severe occasions a small boat (punt) would have been put into service and milk, bread and necessaries would be passed to the upper storey, a circumstance which has been known to last for several days. A reminder that flood waters can rise at any time. Mr JOHNNIE ADAMS – one time Mayor of the Borough of Helston – carries Miss WILLIAMS to dry land. 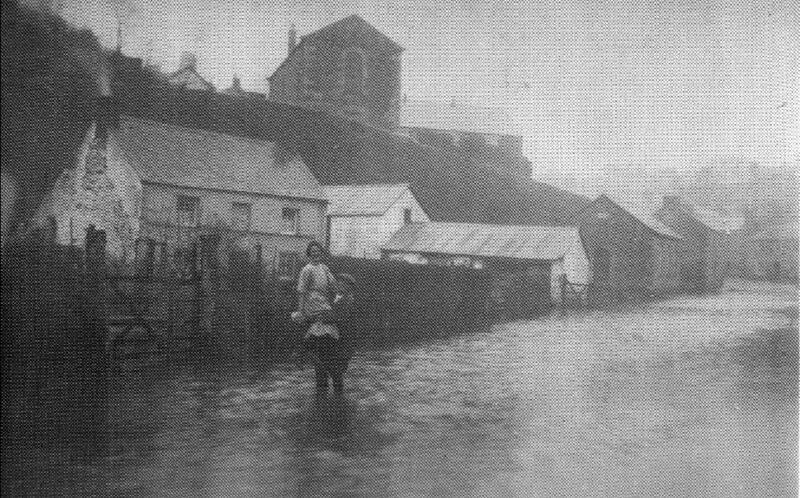 The Penzance road always escaped these immersions as it was on a higher level than St. John’s road but the main road to Porthleven never escaped the experience. The Lake and Park always came in for a full share of the flooding. The chains which formerly kept grazing donkeys from straying and protection from what is now the Lake and Park have been known to have been totally immersed and a boat was used to ferry foot passengers to Porthleven. On these occasions, the whole of the valley extending on to Helston Moors assumes the appearance of a vast lake and enables onlookers to visualise to some extent what Helston and St. John’s may have looked like in former times before the Bar Sands barrier had been formed. It was in former times the practice, when the wheels of the Helston Mills were impeded by pressure of the rising waters against them, that the Lord of the Manor would be approached by duly appointed persons to request the occupants of Penrose Estate to `open the bar’, which request was accompanied by the presentation of a leather purse containing three half pence. Murray’s Handbook (1865) describes the action taken after the purses had been delivered and the request for permission to open the Bar had been granted. `This being of course granted, the Mayor of Helston engages workmen for the purpose and a small trench being cut in the sand, the pent up waters rapidly enlarge it and ultimately sweep the entire obstruction into the sea. The spectacle is really a fine one. The rush of the emancipated element, the conflux of the waves and the contents of the lake, and the numerous cascades and eddies often glistening in the beams of the moon altogether form a source of singular wildness and beauty, whilst the roar of the troubled waters lends its aid to impress the mind of the beholder. The Bar thus removed for a time is in a few days thrown up as before’ ….. I have heard it spoken that when these occasions arise if a person started a small groove with a walking stick, he or she, would have to run for their life, as the waters would force a wide channel in a very short time! This statement is open to doubt. In February 1979 mechanical excavators were engaged to try to clear a blockage of the outlet caused by a storm which deposited many thousands of tons of sand and shingle blocking the outlet completely. A deep channel was scooped out but no such result as described above was achieved, the sides, twenty or more feet in places would slide as often as the gravel was removed and only a small amount of water trickled down. Photographs showed the channel excavated and the small flow of water released, the other picture shows the height of the dammed backwater and the effort being made, excavation and suction, to free the outlet. The sea, whose action choked the entrance of the cave like outlet, reversed the circumstances during another storm and removed the huge bank of sand and shingle, which had been accumulated. “Went to Loe Bar with Graham to see the works of freeing the outlet adit to sea. Water is rising in Helston. Porthleven Road and St. John’s Road is impassable to traffic”. I concluded that entry by recording: “A lot of snow fell and remained overnight”. A recurrence of these experiences is always a future possibility. In 1813 the bridge was built over the Cober and the embankment leading to it, carrying the new road across the Lower Green, was opened in 1834, the monument at the bottom of Coinage Hall Street was erected and in the same year the new Grammar School, now incorporated in the Godolphin Hall block, was opened. In 1836 the prison at the top of Shute Hill was built, and in the following year the Baptist Chapel, later a Cinema in Wendron Street. In 1837/8 the Market House, now the Folk Museum and other rooms, was put up and at the same time Penrose Road was constructed. In 1839 the present Guildhall block was erected and in 1840 the United Methodist Free Church, now demolished, was completed in Church Street. All of these items are important in the calendar of Helston & St. John’s history. The bridge carries two dates:1833 and 1861.